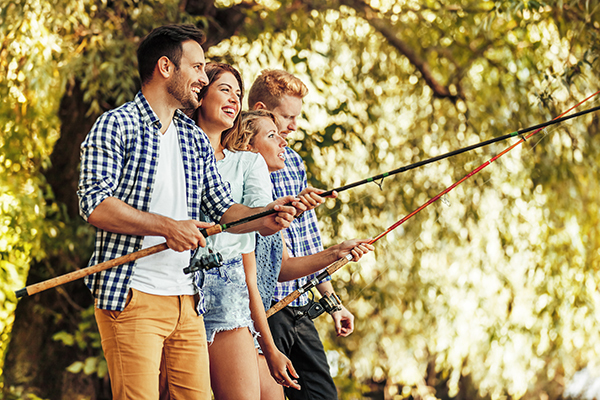 Fishing can be fun as a solo sport, or with friends and family members. However, if you’re looking for a calming and relaxing fishing trip, you’ll need to be careful about who you invite out on the boat with you. Just one toxic friend or family member has the ability to ruin your whole day. The experts at FishingLicense.org encourage all anglers to share the joy and love they have for their sport with their friends, but be wise about the invitations you decide to send out. Review these types of friends you shouldn’t take fishing to be aware of for the next time you’re planning a fishing trip. Fishing can be a serene experience. You’re out early in the morning on a boat, in isolated water, with beautiful nature surrounding you. If you’ve brought your notoriously loud friend, however, all of this serenity can be ruined. Your loud friend is probably the life of the party out at the bar, or a blast to hang out with at a pool party, but when you’re out fishing, he or she will probably do more harm than good. According to the team at FishingLicense.org, this loud friend can not only be a detriment to your calmness, he or she can also scare the fish away. Loud noises or bright lights in the water can make fish scatter, even when they’re busy feeding in the early morning hours. Warn your loud friend about the need for peace and quiet, or consider a solo trip if you’re looking forward to the relaxing calmness of the water. A fishing trip usually means an early morning wakeup call. The team at FishingLicense.org realizes that most fish are more likely to bite in the dawn hours because they’re more active and out feeding. While you may enjoy the company of your night owl friend, he or she may not be the best choice as a companion for an early morning fishing trip. Those who stay up late at night and aren’t fans of the morning usually have trouble waking up and getting ready for early morning fishing trips. More than likely, this friend will hold you up and make you miss those early morning hours where you usually have the most fishing success. Everyone has that one friend who thinks he or she is an expert at every subject. If you’re an experienced fisherman who has a know-it-all friend, he or she may not be the best choice to bring out on the boat. When you’re an experienced angler who knows the local water well, a friend who tries to tell you what to do and where to go can get annoying fast. The experts at FishingLicense.org encourage all knowledgeable fishermen to always make decisions based on what they know, their past experiences, and their gut feeling about a situation. If you bring a know-it-all friend on a fishing trip with you, the bossiness and antics might ruin your trip, or influence you to make decisions that go against what you’ve been taught. Having friends who have never fished before but are interested in learning is great. However, if you decide to invite a novice friend with the intention of helping him or her, be sure you’re ready for what that type of trip entails. Your novice friend will need help baiting the hook, casting off, reeling in, and may even need some help with boat etiquette. This can mean that you don’t have any time to cast your own line or enjoy your trip. If you’re planning to invite a novice friend on your next outing, be prepared to dedicate your time to teaching. You’ll need to muster up a lot of patience to help teach him or her about fishing. While you may not get much fishing done with your own rod, helping your novice friend to learn about the sport and sharing your passion for it may be satisfying in its own right.